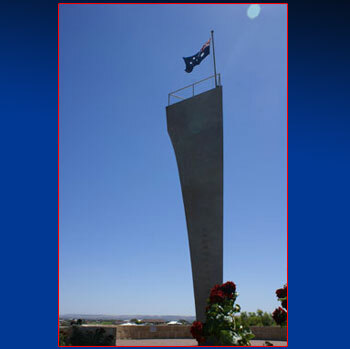 HMAS Sydney II Memorial, Mount Scott, Geraldton W.A. To design a Memorial of National Significance, which commemorates the loss of HMAS Sydney II, the greatest single tragedy in Australian Naval History, and dedicated to the lost Crew and their families. To create a special space of contemplation and reflection within a memorial setting. To develop the area to its full potential with regard to it’s function as a sacred site. To create elements and features which will embody all the necessary symbolism and commemorative aspects for this Memorial to fulfil its function as a Memorial to the lost 645 crewmen of HMAS Sydney II and their families. To express particularly the concept of loss and emptiness in relation to this tragedy where no survivors or bodies were recovered or the whereabouts of the ship identified in 1999. To create a place suitable for ceremonial occasions, commemorative events, flag raising, wreath laying, in order to facilitate both public and private remembrance. To create a design suited to the spectacular and unique site on Mt. Scott, Geraldton while allowing for the difficulties of the location with regard to its exposed nature and with particular regard for its ability to be viewed from the town and countryside around. To allow this space to be utilised comfortably and with suitable access in relation to all age groups and physical abilities. To function as an informative area with narrative elements which serve as educational instruments for the general public of all ethnic backgrounds, children and overseas visitors. To incorporate symbolic as well as narrative features. 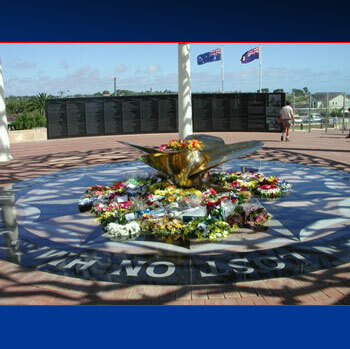 To include the names of all those who were lost on HMAS Sydney II on November 19th, 1941. The Memorial to HMAS Sydney II is to be situated at Mount Scott, Geraldton, Western Australia. In it’s entirety it will encompass the designated site, which comprises the top of Mount Scott. The design can incorporate the landscape plan already in place with some modifications. This allows for extensive low planting of native shrubs, access pathways and a central circular area, which has been designated for the principal Memorial elements. This central area contains several features, all with varying functions and symbolic elements. A path, curving upwards to what is in fact a plateau at the top of Mt. Scott. This path becomes a ceremonial entrance ramp to the dedicated area, and is guarded by two old bollards, from the Port of Geraldton, which almost certainly were used by the Sydney, to tie up to, on her last visit to Geraldton in 1941. This dedicated central area is comprised of a domed structure forming a Sanctuary, a vertical structure forming a Stele and a Wall forming a semi-circle, split in two, to allow access to the interior of the inner circle. This entry point into the dedicated area is flanked by flagpoles, set in real bronze ship’s propellors, echoing the Altar at the centre of the Dome of Souls. The path then follows the outside of the circle from which it extends to the Stele, on the right. Another branch turns towards a bronze figure of a woman looking out to sea, on the left. It should be noted that while all elements of this design combine to form the entire Memorial, each can also stand alone in its own right. This is the centrepiece and inspirational heart of the entire complex. It is the starting point for the Memorial concept and has been the source and wellspring of the most fundamental basis to the whole idea. It’s validity as a concept is based on the fact that it was directly inspired by an incident, which took place at the Dedication of the Memorial site on 19th November 1998. A flock of sea gulls swooped over the assembled crowd at the setting of the sun, while the notes of the Last Post rang out in the evening air over the Indian Ocean, on the West Coast of Australia where HMAS Sydney sank without a trace, 57 years before. This inspiring moment is encapsulated and frozen in space and time by the formation of the domed roof by a flock of stainless steel sea gulls, ( Larus novaehollandiae- “Silver Gulls”) comprising 645 individual elements, representing the Crew of the Sydney. Birds are symbolic as spirits of the dead; the soul freed from the body; ascent into heaven; the ability to communicate with God or entering into a higher state of consciousness. They depict the celestial realm and powers opposing evil. These birds are symbolic of the Souls of the departed, expressed in this ethereal way, serene, elemental and as spirits flying free, between water and sky. Historically, the souls of drowned sailors were believed to be embodied in Sea Gulls. So, it was as if, at that moment of Dedication, they flew past, to give their imprimatur to the building of the Memorial and confirm their transcendence. This incident has created an opportunity to produce a totally unique concept, specific to the Memorial to HMAS Sydney II at Mount Scott, individualising the Memorial in a distinctive way for all time. 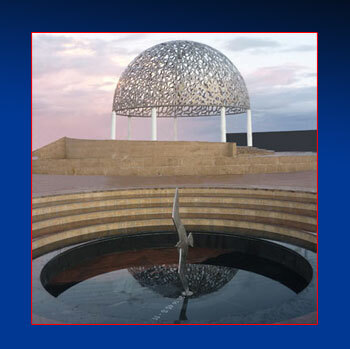 This cupola of birds, 9 meters high and 12 meters in diameter, is intended to be uplifting in nature while enclosing a sacred space of remembrance and a symbolic link with the men of HMAS Sydney II. It forms a canopy, which is a filigree of stainless steel and an open weave dome. The whole effect of distilled light reflects the silver sea, creating a sense of disembodiment and peace. Standing at the centre of this empty space, one becomes aware of the vastness of the ocean; this great open grave and as one’s eyes are drawn upward towards the light, there is a sensation of looking up at the surface of the sea from below. 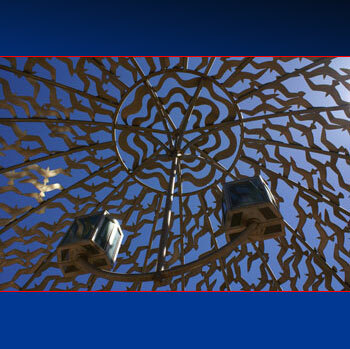 By day, the beauty of the Geraldton blue sky can be glimpsed, filtering light through the silver winged shapes into the Memorial inner space; while at night, the cupola, lit internally, would form a dome of gold, glowing on the top of Mt. Scott. This inner space in itself is highly symbolic and is designed to be evocative of the emptiness left behind by the missing crewmen. The dome surmounts seven pillars, representing the Seven States and Territories of Australia.They are also symbolic of the Seven Seas. These would be constructed of Stainless Steel and can carry various emblems or insignia. They are set at intervals, which allow for open viewing at the West Side to the Indian Ocean. Symbolically, the pillar is the world axis, the vertical axis that joins Heaven and Earth. Pillar and tree symbolism is connected and the pillar in this context represents the Tree of Life. The pillar is also wisdom, power, goodness and strength. The pillar surmounted by a crown is the architectural symbol of the highest point and is the most direct way of spiritual ascent, from darkness into light. These pillars support the ‘crown of birds’, and traditionally, the bird itself on a pillar, is symbolic of the union of spirit and matter. The Podium of the Memorial is circular in form, echoing the shape of the Dome above. It is composed of cut stone from all the Seven States and Territories of Australia, symbolising the National composition of the crew of HMAS Sydney II. Thereby, the National quality of this Memorial is established. The design is based on the Nautical Compass incorporating various symbolic elements based on the Sea Gull and the Stele motifs. The filtered light flowing through the canopy of birds, throws reflected shadows on the ground below, creating, through the shifting light, a sense of movement, like clouds passing over the sea or the flight of the sea gulls which inspired the concept. From the podium at the centre of the circle, an altar rises. This provides a formal place for wreath – laying on ceremonial occasions. It is hoped to procure an authentic ship’s propeller for this feature, which being cast in bronze. 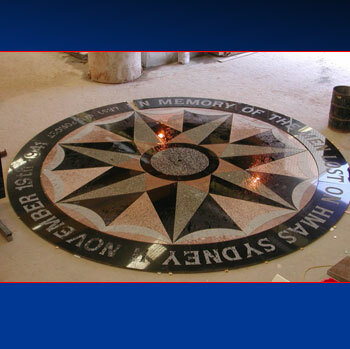 The circle forming the floor of the Memorial is symbolic in itself. It is a universal symbol of totality, wholeness, infinity, eternity; it represents ‘time enclosing space’, but also ‘timelessness’, as having no beginning or end and ‘spacelessness’ as having no above or below. It is the abolition of time and space, but also signifies recurrence. Limestone walls, curved to follow the basic form of the Memorial, delineate various areas and echo the theme of the Circle, which is the basis of the whole design. Steps are formed at the base of the Podium, for ceremonial wreath-laying or personal dedication. These steps also can serve as seating, for rest and contemplation. They allow the visitor a poignant, but superbly breath-taking view out over the City of Geraldton below to the Indian Ocean beyond, in the depths of which, the Ship now lies. The domed roof forms an inverted bowl shape, which could hold an Eternal Flame. This would provide lighting effects, which would be particularly evocative at night. It would also form the centrepiece for ceremonies and keep alive, symbolically, the spirits of the men. The Flame is symbolic of eternal life and spiritual power, unseen ‘energy in existence’. It is a manifestation of the soul. It is proposed to create a double lantern feature: one red and one green, symbolic of the Ship’s Port and Starboard lights. 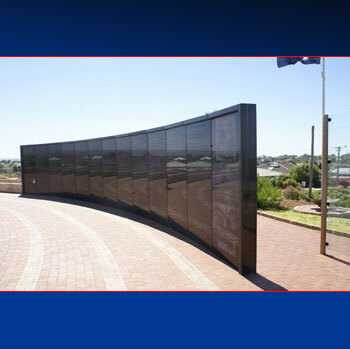 A semi-circular wall in West Australian Black Granite, embedded with flecks of natural gold, encompasses the South West sides of the Memorial. This represents the ‘encircling arms of the Nation’, welcoming home its Lost Loved Ones. The wall is divided in the centre to allow access to the Memorial from the Ceremonial Pathway. The exterior, convex side of this wall, which faces visitors as they ascend towards the top of the summit, will bear a ‘wave motif’ in low relief, symbolic of the Indian Ocean where the men of the Sydney now lie. The interior concave sides bear the names, rank and home base of the 645 men who lost their lives. At the Entrance Portal, also on this concave surface, composite images from actual photographs, are photoengraved into the Black Granite, depicting Sydney II in action and everyday scenes from life aboard the Ship, including a group photo of the full Ship’s company. This technique of graphic portrayal has been selected as a means of communicating the complexity of imagery and detail in its most direct and immediate form. Two other panels carry the history of the Sydney and the artist’s statement of concept and design. The technique of grit blasting photo-quality images into granite gives a stunning effect, providing a sense of realism to the visitor, and especially to future generations, for whom the historical detail and reality of the incident might become lost. The Black Granite panels have been spaced slightly apart to allow for Poppies to be placed beside individual family names. “ THE REST IS SILENCE”, is engraved into the stone. The Stele, which is based on the concept of ancient Standing Stones found throughout the World, were used as markers of graves or commemorative sites, since time immemorial. This is expressed in the form of the prow of HMAS Sydney II. It also incorporates all the symbolism of the pillar concept as well, described as a tall upright column in its own right. In this context, the striking shape has been developed through a process of visual reductionism, in which the ship concept is distilled into a single dramatic gesture. Its function as a towering symbolic grave marker, while constituting an imposing vertical element, would be visible from many miles in all directions. The mast element can be further used to carry flags and insignia for the Memorial. 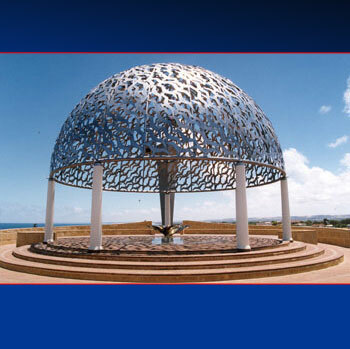 It is designed to be fabricated in stainless steel to link with the Dome of Souls and to symbolise HMAS Sydney II, herself. Water depth markers based upon the actual Sydney markers are set onto the prow element. As one moves through the spaces of the Memorial, absorbing the feeling of quietude and contemplation induced by the serenity of the surroundings, one’s eye is drawn towards the horizon, along the pathway towards the sea. At the edge of the cliff stands a figure of a woman. At first glance, this will appear almost real: just another visitor, holding her hat against the sea breeze, her skirt blown back by the prevailing wind. She is anxious, tense; her gaze forever fixed patiently on the horizon. It only becomes apparent as one waits for her to move away, that her stillness is otherworldly, like the young man she is seeking, already in another realm. She is in fact, frozen in time and bronze. She is eternal, all-encompassing; the figure of the waiting woman, grieving for her lost father, husband, brother, son. Through her, we can feel the pain of that loss, the everlasting waiting of those who did and of those who still do. She stands here, for those who will come to this place, still hoping that the ship will be found, to close this tragic chapter in Australian history. She is also here for those who will at least find comfort in the existence of this sacred site; this place of contemplation which honours and remembers the great sacrifice of those who gave their lives, to make Australia safe and free for the people who live in this Country today. This concept was evolved as a fitting expression of all the people involved directly in this terrible tragedy. To portray the men from the ship herself, would be very difficult as any particular scene would personalise a single group too much, at the expense of others. All were equally involved and all suffered a similar fate. However, no matter what role these men played, they all had loved ones: wives or mothers, girlfriends, sisters, daughters; someone to mourn them; a woman somewhere who didn’t experience this terrible drama directly, but felt the connection through the eternal pain of loss and emptiness for the long years that have passed. 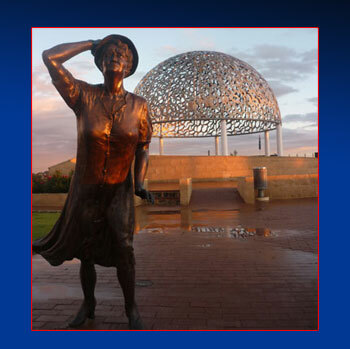 The men of HMAS Sydney II will always be remembered by these women, and the surviving families. It is to them this Memorial is also dedicated. “The Waiting Woman:” sculpture: -Inspiration. Although I have been asked many times if the inspiration for the Waiting Woman sculpture had a single focus or was a particular person, I never confirmed or denied it. I did not wish to take ownership over her, as I believed she belongs to the HMAS Sydney family and the people of Australia. Now, that the Statement of Significance document is being prepared, however, I feel that the time has come to declare the true inspiration and ‘raison d’etre’ for the sculpture as a matter of historical importance. The inspiration, in fact, emanates from my mother, who is the subject of the sculpture. During the design development of the Memorial, several people, mostly women, mentioned the idea of doing some representation of the families. Indeed, a ‘mother’ figure seemed to be paramount in most people’s minds. Of great interest to me is the fact that Mitochondrial DNA is passed down through the female line, thus connecting the entire HMAS Sydney family, through the Mother. The Waiting Woman began to emerge. The personal inspiration for me as the artist, was a particular piece of family history, which resonated with me down through the years. This was the story of Dan Hogan, my mother’s most beloved brother, who served and was taken prisoner in World War I and lost his life in World War II. On 16th of March 2008 the wreck of HMAS Sydney II was found in position 26 14 45 S – 111 12 55 E.
The intention is to complete the original HMAS Sydney II Memorial project by incorporating concepts that were not possible for the 60th Anniversary in 2001 and which could only be implemented upon the discovery of the location of the Sydney. This occurred on 16th March 2008 and the Pool of Remembrance Project was launched. This would be achieved by the creation of a dignified commemorative area of contemplation and remembrance, complimentary to the existing Memorial precinct, without intruding on any previous symbolic elements. It is a ‘ circle within the circle’ of the original Memorial, which symbolizes the ‘circle of life and death’ and the concept of Eternity and the Infinite. 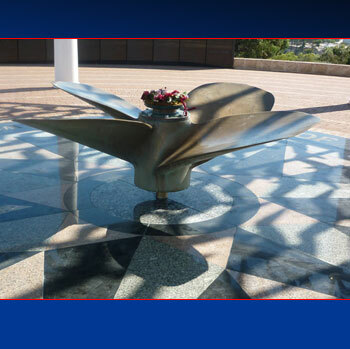 The centerpiece and heart of this ‘element’ is a Pool of Remembrance. As an appropriate place of commemoration and contemplation, it was decided that no new vertical elements or major dramatic features would be used in the design. The final concept is a simple, recessed pool, approached by circular terracing symbolically descending ‘down’ into the depths, as it were, evocative of the war grave where the ship now silently rests on the sea floor, 2,500 meters deep, 120 nautical miles off Steep Point, Shire of Shark Bay, WA. The floor of the pool forms a map, 5 meters across, showing the location of HMAS Sydney II, embedded in coloured granite. A 2-meter high Stainless Steel gull is fixed on wingtip to the exact spot where the Sydney lies, with the co-ordinates radiating out from this, both on the exact bearing towards the wreck site. 26 14 45 S – 111 12 55 E. A circular waterfall pouring out from under the bottom terrace dramatically reinforces the concept of ‘going down into the depths’ and provides the final element all Naval Memorials should have; water! Inspired by the shadow pattern of the gulls under the Dome of Souls, the lowest terrace circling the Pool is formed in polished black granite, into which is engraved images of 644 Silver Gull shadows, enclosing the pool and the ship. The 645th Sea Gull stands alone on the co-ordinates of the Wreck site in the centre of the Pool. This two meter high vertical Silver Gull is Number 645. The polished black granite symbolically links this final terrace to the Wall of Remembrance. At night, circles of under-step LED Lighting create a somber, haunting effect, underscoring and amplifying the quiet contemplative atmosphere of the surrounding Memorial precinct. Close by, the Waiting Woman waits no more. Now she watches over her loved ones, eternally at rest. A major aspect of the idea behind the Circle of Life and Death, was the concept of the Arms of the Nation welcoming back it’s ‘Lost loved ones’– in effect what the Waiting Woman is waiting for, has now been found. She is no longer ‘alone’. Her loneliness, sense of loss & waiting has been tempered by the discovery of the ship where her men now lie. By enclosing the Pool of Remembrance, with all its own particular symbolism, we are in effect ‘enclosing’ the Lost Loved Ones in a final embrace of comfort and love- giving them back, as it were, to their families and friends in an ultimate gesture of peace. This is the principle reason why we chose the location for the Pool of Remembrance beside the Waiting Woman. The circle of life and death embodied in the original design of the National Memorial to HMAS Sydney II, Mount Scott, has now been closed. 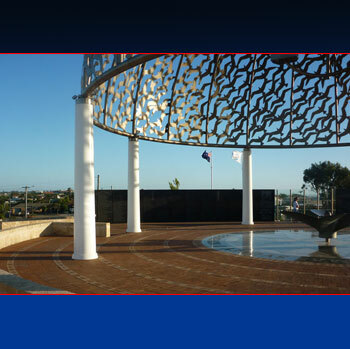 “It is our intention, with the help of the City of Geraldton, to reinstate the sculpture on site, on the same alignment, but with a minor adjustment to coincide with the exact co-ordinates which have been confirmed since the Finding of HMAS Sydney II, in 2008. This would allow us to achieve the absolute accuracy of this positioning, which is of major significance to the entire Memorial and fulfill our original design philosophy, whereby the Waiting Woman is turned, looking towards the spot where the Sydney was lost. In fact we should note for your interest here, and to reiterate the integrity of this rationale, that although originally, we could not know the position of the Wreck, the Waiting Woman is actually pointed within a fraction of the correct location. This was an amazing occurrence, but has become a story which fascinates the visitor and gives an astounding authenticity to the sculpture. Everything depends on this: her whole expression, in fact, is based on the utter belief of a mother, that she knows where her son is. This is a golden opportunity to complete the story and to unite her visually and emotionally with her lost sons. In order to emphasise the authenticity thus, of her positioning, we propose inserting into the paving the actual coordinates of the Wreck Site. These would be identical to the stainless steel coordinates on the map in the Pool of Remembrance, and would reinforce the actuality of her gaze. As a further enhancement to the entire Memorial, utilizing the opportunity while reinstalling the sculpture, we suggest that we move the sculpture one meter back, This subtle adjustment will have several beneficial effects: it engages the sculpture with the Pool of Remembrance in a profound way, emotionally, visually and artistically. The sightline across the Pool, to the Waiting Woman from the South, is thus dramatically enhanced, as it visually engages her silhouette as a poignant gesture against the North West skyline, while ever so slightly integrating her more fully along the axis with the Pool of Remembrance. In this way, without any major dislocation, we maintain the original sense of loss and loneliness expressed by her stance, while gently intensifying the new reality of her proximity to her beloved sons. This tiny realignment truly ‘closes the circle’ and is strictly in line with our original design philosophy. We cannot stress enough that we take our artists moral rights to the design, and our responsibilities in respect of this, very seriously. Accordingly, every tiny aspect of our concept for the HMAS Sydney II Memorial at Geraldton, weighs heavily upon us. Our proposal to make this slight adjustment to the Waiting Woman Sculpture is the result of a considerable effort on our part and entirely consistent with our original design intention. We can assure the Commissioners that the enhancement gained will be of substantial benefit to the entire Memorial.